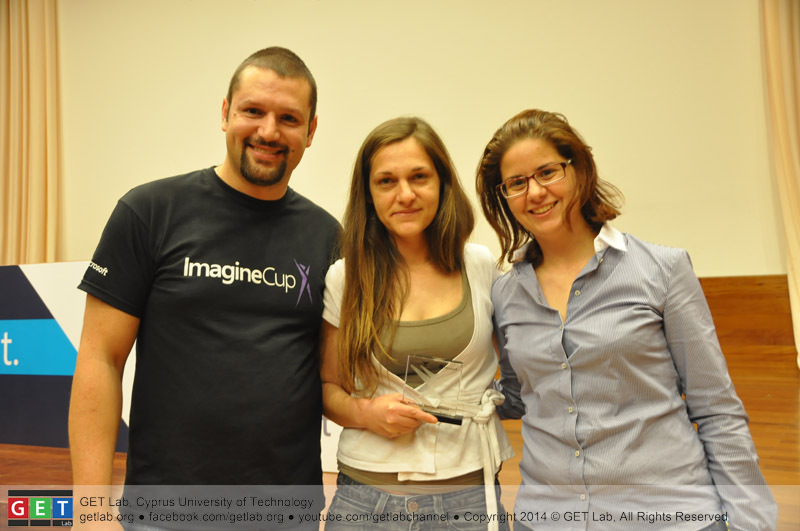 GET Lab has been awarded the Imagine “Games” Cup 2014, at the national finals that took place on 28 April 2014. The Imagine Cup is a global student technology competition, held in more than 80 countries under the aegis of Microsoft. GET Lab had two teams participating in the competition. “Dive”, the winner, was led by Kalia Aristeidou, a postgraduate student and researcher at the Lab. The diving simulator, still at the prototype stage, is intended to serve as projection tool for the Zenobia shipwreck, as well as for organizing dives and training divers. The simulator allows the user to virtually dive into the Zenobia shipwreck and observe elements of marine life encountered there. Also, by means of a materialized algorithm based on the classic decompression theory, users are able to know their allowed time limit at any particular depth. At the same time, they may be trained in autonomous diving and evolve by unlocking different functions of the simulator. Also participating in the competition, the “i.3.T” group of postgraduate students Christos Kyrlitsias and Christina Papadopoulou, stole the impressions. The “i.3.T” is a game platform designed for use with different methods of interaction. Specifically, the game operates on the use of a keyboard, a joystick, kinect as well as a touch screen in android mobile devices. The groups were made up of postgraduate students at the Inter-University Postgraduate Programme “MSc in Computer Games and Interactive Technologies”, with lecturer Dr Despina Michael serving as scientific advisor, as well as coordinator for GET Lab and the postgraduate programme. Of note is the fact that the winning team, namely “Dive”, will represent Cyprus in the next stage of the Imagine Cup 2014 global competition, to compete with other national winners.